We especially love it when our customers send us great pictures of the products that they grow from Johnny's Selected Seeds. 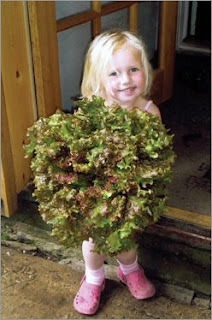 One of our customers, Westridge Produce from Blue River, Wisconsin, recently sent in a photo of their daughter, Autumn Rose (4), holding a huge head of lettuce that Johnny's sells called "New Red Fire". This head of lettuce looks almost as big as Autumn! Mom and Dad (Kimberly and Jake Jakubowski) must be very proud! Westridge Produce, located in southwestern Wisconsin, farms intensively and organically on 1 acre. Per Kimberly, they sell their produce at local farmers markets and co-ops. Kimberly reports that this is their 3rd year of doing the garden full time and she gives all the credit to her husband of 10 years, Jake (they are celebrating their 10th anniversary in August - congratulations Kim and Jake!). They have a small hoop house that they use to start their seeds in and they hope to get a greenhouse this fall and try some greenhouse tomato varieties. Good thing Johnny's has them! Autumn Rose also has a little brother, James, who is 16 months old. Thank you, Jakubowski Family, for sending in the terrific picture and for sharing with us. We at Johnny's wish you the best growing season yet - and when you get pictures of those greenhouse tomatoes, be sure to send them in!